DragonFable - Design Notes: The Book 3 Timeline! For this month's Reimagined release, we have something much requested, much anticipated, and much needed. Book 3 has had some incredible stories so far, taking you across the Land of Dragons, the Land of Fables, and more jumps around time than a rabbit jumps to a salad. This, along with some questionable story prompts and linkages, led to an unintuitive and confusing story, which, while it was fantastic when unravelled, was incredibly hard to decipher (with the odd plot hole along the way). So, this week, we're proud to release the Book 3 Timeline. This will replace the old "The Story" button when you click Book 3 in the Book of Lore. The Book 3 Timeline contains the most major quest chains in Book 3, with story summaries for major plot arcs, and buttons to travel to relevant locations, all on a convenient and beautiful timeline! We also plan to do a Book1/2 timeline in the future! Horizontal scale on the timeline may not be accurate to the passage of time, but positions of nodes are accurate relative to each other. This means that story arcs are in order, but the time they take, and how long they are relative to each other may not be accurate. This does not include every quest or quest chain in Book 3. We highly encourage exploration and wandering around the lands of Lore, but these are the most major events and stories. 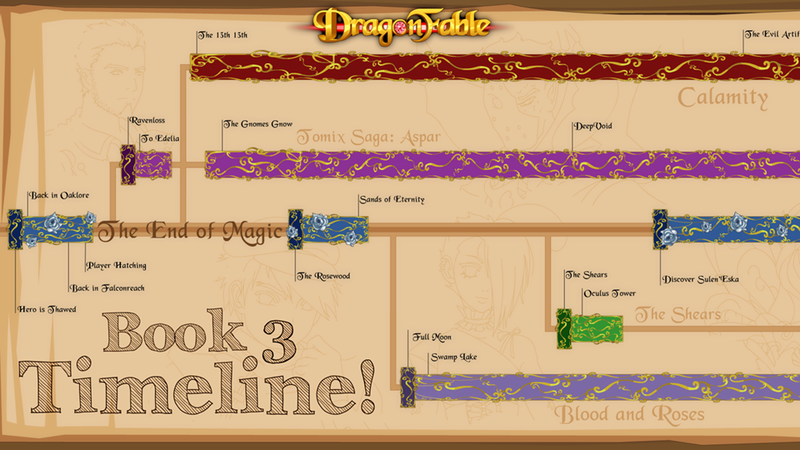 So without further ado, please, log in, and enjoy this week's release: The Book 3 Timeline! You can access it from the Book 3 tab in the Book of Lore! Along with this week's timeline release, we've updated a couple old quests to fill in plot holes or just general playability. The quest Shear Destruction has had its dialogue mostly reworked, as Leon's motives and the player's motives seemed unclear and out of character. The dialogue also previously placed it in a questionable area of time, and this has been resolved. You only require 2 Rose Emblems to enter Sulen'Eska for the first time, down from 20. Seriously, 20? That was insane. Symone at Castle Valtrith has had her quests reorganized for the Calamity saga, and the Calamity Saga has been made more prominent in her buttons. We are also encrypting our user data with a higher level of encryption. As part of this, passwords are now case sensitive- if you can no longer log in, you can try resetting your password. Have any feedback about the Book 3 Timeline? Is there anything you'd like to see that wasn't included? What would like to see reimagined in the future? Let us know on the forums and Twitter!